Some people would say I’m a bit “old” to be learning all of these seemingly “simple” hairstyles. 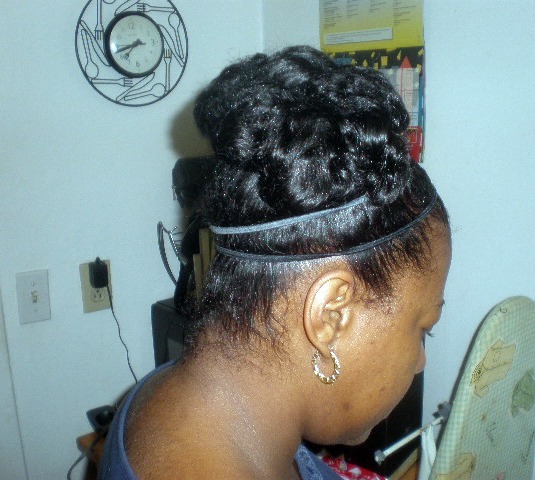 Maybe so, but I had relaxed hair for so long that I did not really style it much other than wrapping it. So, today’s hair feature is just me sharing the results of doing pin curls. I tried to do them in the past many times and they always came out frizzy looking. Just grabbed sections (rushing), not taking in to account that they needed to be even. Not rolling the hair up properly. For a pin curled hairstyle, you need to leave some volume to the curl and not pin it flat against the head. Also, I’ve gotten much better at pin curling my hair by slightly varying how I do it. They come out much nicer when I twist the section loosely at the ends first. Pin curls are definitely a very elegant looking way of styling the hair. Learn from my mistakes for your best laid set. Do you wear pin curls? How do you make them look nice and neat? First of all let me say your bun looks great!!!!!! I pinned curl my hair before and had several failed attempts. What I did wrong was I made them too tight. Since my hair is uneven, trying to get every curl pinned down was a chore. I finally learned just to take small sections and work with that. Thanks girl! I had the same issue with rushing and taking big pieces. I guess the key is to take your time. I think it helps when the hair is stretched too. It looks really cute Michelle! I’m swiping the pic as the lead for a reblog of your JBCO Protein conditioner review!! Well alrighty then lol. I think it also came out better because I had did a henna not too long before.